The media is widely reporting a terror threat against the Mall of America by Al-Shabaab, a Somali Muslim terror group. None of them are reporting why the Mall of America in particular would be a target. Minnesota has its own Little Mogadishu which, aside from the usual welfare fraud and crime, also hosts supporters of Al-Shabaab. ISIS and Al-Shabaab successfully recruited dozens of teens and young adults from Minnesota. Poppy Harlow finds out why and what’s being done to stop it. Organizers estimated roughly 10,000 people attended the rally on Wednesday, according to the Associated Press. TEL AVIV – As Jews here commemorated the destruction of the First and Second Jewish Temples, masked Arabs on the Temple Mount used a mosque to amass stones, Molotov cocktails and other explosives with the intent of attacking Israeli police and Jewish worshipers ascending the holy site. The Arabs, described as mostly youth, engaged in violent clashes with Jerusalem Police, who used non-lethal means to push the rioters into the al-Aqsa Mosque to prevent what would have been a major attack on Jewish worshipers Sunday. The Arabs holed up overnight inside the al-Aqsa Mosque, where they set up barricades using shoe racks, iron rods, and ropes to prevent the police from entering. The plan was reportedly to attack Jewish worshipers Sunday as Jews worldwide celebrate the Jewish fast day of Tisha Báv, or the ninth day of the lunar Jewish month of Av. The day marks the anniversary of several major disasters in Jewish history, most notably the destruction of both the First and Second Jewish Temples in Jerusalem. Citing intelligence on the pending Arab riot, Jerusalem Police headed toward the outside platform of the al-Aqsa Mosque, where numerous masked rioters were preparing an attack, in a bid to thwart the violence. The police did not enter the mosque itself. “The police were attacked immediately upon entering the Temple Mount compound by Palestinians armed with rocks, firebombs, fireworks and metal pipes,” Jerusalem Police Spokesperson Micky Rosenfeld told reporters, adding that four police officers were lightly wounded during the raid. The police pushed the attackers inside the al-Aqsa mosque and locked the door to secure the area and to allow Jewish worshipers to ascend the site. Israeli President Reuven Rivlin commented on the attack. The communications minister and government spokesman for the Kingdom of Jordan, Mohammad al-Momani, astonishingly called the Jerusalem police action an “Israeli provocation against Arabs and Muslims by breaking into the al-Aqsa complex.” He did not mention the police raid was in direct response to the Arab attempt to attack Jewish worshipers, that the Arabs had first used the mosque as a place to store munitions intended in the attack, and that the police did not actually enter the mosque. The Temple Mount is the holiest site in Judaism. 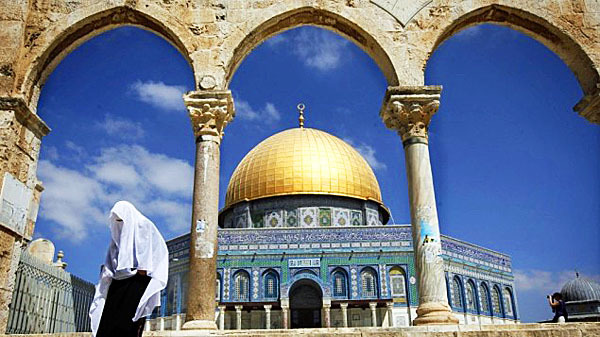 Muslims now claim it is their third holiest site, although their stake changed several times throughout history. The First Temple was built by King Solomon in the 10th century B.C. It was destroyed by the Babylonians in 586 B.C. The Second Temple was rebuilt in 515 B.C. after Jerusalem was freed from Babylonian captivity. That temple was destroyed by the Roman Empire in A.D. 70. Each temple stood for a period of about four centuries. According to the Talmud, the world was created from the foundation stone of the Temple Mount. It’s believed to be the biblical Mount Moriah, where Abraham fulfilled God’s test of his willingness to sacrifice his son Isaac. The Temple Mount has remained a focal point for Jewish services for thousands of years. Prayers for a return to Jerusalem and the rebuilding of the Temple have been uttered by Jews since the Second Temple was destroyed, according to Jewish tradition. The al-Aqsa Mosque was constructed in about A.D. 709 to serve as a shrine near another shrine, the Dome of the Rock, which was built by an Islamic caliph. Al-Aqsa was meant to mark what Muslims came to believe was the place at which Muhammad, the founder of Islam, ascended to heaven to receive revelations from Allah. Jerusalem is not mentioned in the Quran. It is mentioned in the Hebrew Bible 656 times. Islamic tradition states Muhammad took a journey in a single night on a horse from “a sacred mosque” – believed to be in Mecca in southern Saudi Arabia – to “the farthest mosque.” From a rock there, according to the tradition, he ascended to heaven. The farthest mosque became associated with Jerusalem about 120 years ago. According to research by Israeli author Shmuel Berkovits, Islam historically disregarded Jerusalem as being holy. Berkovits points out in his book “How Dreadful Is This Place!” that Muhammad was said to loathe Jerusalem and what it stood for. He wrote Muhammad made a point of eliminating pagan sites of worship and sanctifying only one place – the Kaaba in Mecca – to signify there is only one deity. The Temple Mount was opened to the public until September 2000, when the Palestinians started their Intifada, or “uprising,” by throwing stones at Jewish worshipers after then-candidate for prime minister Ariel Sharon visited the area. Following the onset of violence, the new Sharon government closed the Temple Mount to non-Muslims, using checkpoints to control all pedestrian traffic for fear of further clashes with the Palestinians. The Temple Mount was reopened to non-Muslims in August 2003. It’s been open to non-Muslims only during certain hours, and not on any Christian, Jewish or Muslim holidays or other days considered “sensitive” by the Waqf. During “open” days, Jews and Christians are allowed to ascend the Mount, usually through organized tours and only if they conform first to a strict set of guidelines, which include demands that they not pray or bring any “holy objects” to the site. Visitors are banned from entering any of the mosques without direct Waqf permission. Rules are enforced by Waqf agents, who watch tours closely and alert nearby Israeli police to any breaking of their guidelines. Today’s show illustrates how President Obama’s three “I” failures have dramatically compromised the national security of every American in just 6 short years that he has been in office. Obama and his Administration have been abject failures with these three “I’s,” Israel, Iran, Islamic State. Combined, these failures of policy, negotiation and war-fighting have so compromised the stature of the United States globally, that our enemies no longer fear us and our friends no longer trust us. Tune in as this is Tom Trento’s first day back from a special assignment and we find out what he has been up to! In part four of our five-part series on Apocalyptic Iran, we introduce a new, dangerous aspect of the Iran-America nuclear negotiations. Follow this – IF Iran prevails in these negotiations and IF Israel is forced to attack Iranian nuclear facilities THEN there will be intense and violent protests around the world against Israel. Once this happens, in light of the Muslin Survey we present on the show today, America is in for some very deadly and dangerous days. Why, because this recently compiled survey indicates that almost 1,000,000 AMERICAN Muslims believe that either violence and or the Shariah law are part of their system to fight and defeat America. That’s a hell of a lot of angry, violent practitioners of the religion of peace. What do we do? Tune in to find out. Four U.S. Marines, barred from carrying weapons at naval training facilities despite explicit ISIS threats against our military, are dead in Tennessee. Another service member and a Chattanooga police officer survived gunshots after Thursday’s two-stage massacre allegedly at the hands of 24-year-old jihadist Muhammad Youssef Abdulazeez. Navy Secretary Ray Mabus called the terrorist’s spree “insidious and unfathomable.” President Obama bemoaned the “heartbreaking circumstance” in which the murdered Marines found themselves. Here’s what’s unfathomable: While the social justice warriors in Washington bend over backward to appease CAIR and Muslim civil rights absolutists, Americans in uniform are dying on American soil at the hands of Allah’s homicidal avengers — but the commander in chief couldn’t even bother to deliver a live statement to the nation yesterday about the bloodshed. Instead, Obama issued another bland, bloodless pronouncement about the assassinations of our disarmed troops. “Heartbreaking circumstance”? Lightning strikes are random events of unfortunate circumstance. The concerted attacks and plots against our troops in their recruitment centers and on their bases here at home are outrageous acts of war. It should be noted that Muhammad converted to Islam at Tennessee State University in Nashville and then became further radicalized in Yemen before returning to the U.S.
As I noted at the time, Obama could barely muster up a limp written statement expressing “sadness” over what he described as a “senseless act of violence” (instead of the intentional systematic act of Islamic terrorism that it was). In June 2011, the feds charged Muslim jihadists Abu Khalid Abdul-Latif and Walli Mujahidh of conspiring to use machine guns and grenades to “kill officers and employees of the Department of Defense who worked at the MEPS (Military Entrance Processing Stations) located in the Federal Center South building in Seattle, Wash., and to kill other persons assisting such officers and employees in the performance of their duties.” They both pleaded guilty, but remained unrepentant and defiant. In 2012, Ethiopian-born jihadist Jonathan Melaku pleaded guilty to shooting at the Pentagon, Marine and Coast Guard recruiting offices, and the National Museum of the Marine Corps, as well as trying to desecrate graves at Arlington National Cemetery containing the remains of U.S. veterans who fought in Iraq and Afghanistan. In April 2015, Mohammed Abdullah Hasan was arrested after the feds uncovered his ISIS-linked plot to kill American soldiers with a vehicle bomb at Fort Riley in Kansas. ISIS hackers have explicitly targeted 100 U.S. service members whose personal details have been disseminated online. In May, the Pentagon raised the security threat level of military bases in the U.S. to “Force Protection Bravo” — the third-highest threat level on a five-tier scale used by the Department of Defense. You wouldn’t know it from Obama’s languid response. Can someone ask the commander in chief: Do U.S. military lives matter enough yet to do more than issue a canned, obligatory condolence to the families of those who serve? How many more lives must be lost before he is as roused about our troops under jihad siege as he is about Bill Cosby, the Confederate flag, “Game of Thrones” or Caitlyn Jenner? This is not a “circumstance.” This is war. Michelle Malkin is author of the new book “Who Built That: Awe-Inspiring Stories of American Tinkerpreneurs.” Her email address is malkinblog@gmail.com. Mohammad Youssef Abdulazeez grew up in a middle-class Hixson neighborhood, was on the wrestling team at Red Bank High School and graduated from the University of Tennessee at Chattanooga in 2012 with a degree in engineering. He interned at the Tennessee Valley Authority and broke his tailbone once during a jump into a swimming hole. But on Thursday, all that normalcy abruptly crumbled. Abdulazeez, 24, killed four U.S. Marines and wounded three other people when he opened fire on two military sites in Chattanooga, authorities said. He died in the attack, although investigators have not said whether he killed himself or was shot by Chattanooga police officers. No one seems to have seen it coming. FBI officials said they had no warning of a pending attack. And his family and friends are baffled. In January 2014, when the big snowstorm hit Chattanooga, Wilkerson couldn’t get home in his car, so he parked at a gas station on Hixson Pike and started to walk back to the Colonial Shores neighborhood, where he and Abdulazeez lived. As he was walking, Abdulazeez pulled up in a pickup truck and gave him a ride home, Wilkerson said. When he heard about the shooting today, he couldn’t stop thinking about that night. “I just keep seeing his face,” he said. Abdulazeez’s father, also named Youssuf Abdulazeez, works as a soil engineering specialist for the Chattanooga Public Works Department, city records show. A co-worker who asked to remain anonymous said he was a nice man, hardworking, never caused anyone any trouble. The elder Abdulazeez has owned the family’s house at 1902 Colonial Way Circle since 2001, according to Hamilton County property records. On Thursday, he did not return a call on his cellphone. Mr. Abdulazeez was not on the government’s radar, but law enforcement officials said that his father had been under investigation years ago for possible ties to a foreign terrorist organization. At one point, a law enforcement official said that the father was on a terrorist watch list and was questioned while on a trip abroad, but that he was eventually removed from the list. The younger Abdulazeez, who had lived in the Chattanooga area since he was in elementary school, has one incident on his criminal record. He was arrested by Chattanooga police on April 20 for driving under the influence after he was seen swerving while driving on M.L. King Boulevard around 2 a.m. The arresting officer noted the smell of alcohol and marijuana, and said Abdulazeez had a white powdery substance around his nose, according to the arrest report. Abdulazeez told police he had been around friends that night who’d been drinking and smoking. But he failed a sobriety test, was arrested and released on a $2,000 bond. Court records show that’s the only time Abdulazeez has been arrested in Hamilton County. Still, Abdulazeez was not a troublemaker, said classmates from Red Bank High. They said he was well-liked and popular at the school, where he was on the wrestling team. Smith helped carry Abdulazeez out of the woods when he broke his tailbone during a jump into a local swimming hole. “He was one of the guys,” he said. Abdulazeez, a practicing Muslim, would sometimes get in trouble with the wrestling coach for fasting during the season because of the sport’s strict weight requirements, Smith added. Scott Schrader, one of the owners at Chattanooga Fight Factory who trained Abdulazeez in mixed martial arts, said the then-teenager would stop training every day at 6 p.m. to pray. Investigators have referred to Thursday’s shooting as an act of “domestic terrorism,” but emphasized that Abdulazeez’s motives are unknown. The New York Times reported that the family were Jordanians who emigrated from Kuwait to the U.S.
It’s unclear where Abdulazeez worked after graduating from UTC, but Smith said he recently saw Abdulazeez working at cellphone kiosks in Northgate Mall and Hamilton Place Mall. He still can’t believe Abdulazeez was the shooter. In Abdulazeez’s senior photo in a Red Bank yearbook, he sports a tux and smiles into the camera, clean shaven and without the beard he wore when arrested for DUI this year. Under is name is a senior quote, attributed to “Hijabman,” an American-Pakistani activist. TOM TRENTO v. ISA HODGE – ON ISLAM! One of the world’s top expert on nuclear weaponry and Electro-Magnetic-Pulse (EMP) weapons is our in-studio guest as we discuss a variety of critical issues including President Obama’s failure to negotiate successfully with Iran. Dr. Peter Pry, a former CIA analyst details many complex issues in a very simple manner so that non-experts can understand the importance of prohibiting Iran from getting nuclear weapons. BUT, Dr. Pry is of the intellectual school which believes Iran, like North Korea, already has nuclear weapons and is simply “playing” the West to increase their nuclear capability! Sooner or later, whether by man or nature, an EMP will hit the United States and YOU (many of us) will die. Sound crazy, it is, but even more crazy, it’s TRUE! Featured Speakers Include: Clare Lopez (Vice President for Research, Secure Freedom), Mr. John Guandolo (Founder, Understanding the Threat), Mr. David Bores (Woodstock, Georgia, Chief of Police, Retired), LTG William G. Boykin (US Army, Retired) and Mr. Frank Gaffney (President, Secure Freedom). This video is the third panel discussion at the South Carolina National Security Action Summit meeting in 2015. Pamela Geller at the Florida Tea Party Convention in Daytona. Wild Bill for America intoduces Pamela Geller. IT’S RAMADAN – TIME TO KILL SOME JEWS! If you want to break the code regarding how Muslims can increase the killing of Jews during the Muslim holy month of Ramadan tune into our Jumpin’ Jumm’ah Freaky Friday. We start out with a little history lesson where Tom Trento tries to convince us to change Independence Day to July 3rd! Huh? Then we move into a report from Jerusalem Jane, in Jerusalem, about the many attacks this week, against Jews, by Muslims celebrating their Holy Month! Yep, there are dead Jews in Israel because of devote Muslims believing they are doing Allah’s will. Folks, this is evil personified. When the Islamic State terrorists are ready to retire from beheading, crucifying and burning innocent human beings, they will now enjoy a nice benefits package in Stockholm, Sweden, that includes free housing, health care and financial support. In fact, Sweden’s own soldiers don’t even get the same benefits. And some officials are suggesting the law-abiding population pay for the services so ISIS fighters can reintegrate into society. 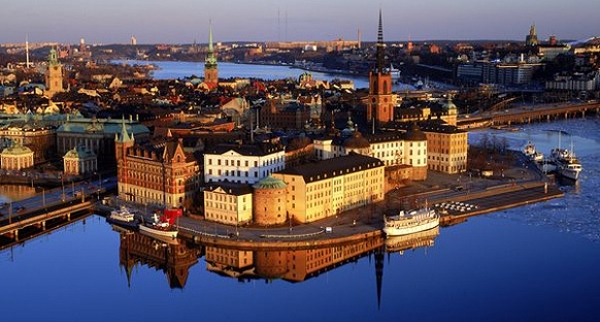 A program to help ISIS fighters rejoin society is already in place in Sweden’s Örebro Municipality, where jihadists can obtain “psychological help to overcome traumatic experiences they may have suffered while fighting in Iraq and Syria,” according to Business Insider Australia. Now the idea is spreading to other parts of the country. Sweden’s official coordinator against violent extremism, Mona Sahlin – a former leader of the Social Democrat Party – advocated using taxpayer funds to pay for the services. After learning of the plan, one Swedish soldier stationed in Kabul during his third mission in Afghanistan posted a challenge on Facebook. He asked that Sweden extend the program to its own warriors returning from duty. “In a few months, I’m back in Sweden after being deployed in Afghanistan, against the Taliban and others who have really jeopardizing development in this very sore country,” Frederick Brandberg wrote. In February, Sweden’s resident expert on “Islamophobia,” a Swedish convert to Islam, joined the jihadist ranks and is now fighting with ISIS. In November 2014, the Swedish government estimated between 250 and 300 of its citizens have traveled to Syria and Iraq to join ISIS. Just two months ago, Sweden’s national job agency fired all of its own contracted “immigrant resettlement assistants” because they were recruiting fighters for ISIS. Sahlin admits Swedish immigration policy has failed. She says she is more worried today than she was a year ago, because Swedish school children are now playing ISIS games in preschool.